The safety of the public will be severely affected if Lancashire Police is forced into further cuts by savage Government savings targets, it was claimed today. 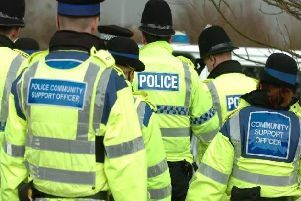 Rachel Baines, chairman of Lancashire Police Federation, which represents rank-and-file officers across the county, has raised a string of major concerns about plans for further cuts to the force. She says by 2021 it is expected the force will have lost more than 1,200 officer posts compared to 2009, meaning a “vast reduction in visible policing” on the streets. She said she fears for the safety of the public because officers will simply not be able to do their jobs and some incidents will not be responded to. And she said it will be harder than ever for the public to report crime because of a lack of front-line police, making it a “field day for criminals”. She said: “We are seriously worried about policing in this county – and not just as officers, but also as residents. “We fear for the safety of the public in Lancashire because we won’t be able to do the job as it should be done. “If anyone tries to assure the public that losing over 1,250 police officers is not going to have an effect on frontline policing then they are deluded. “That is a lot of officers and, even spread over the county; it is bound to have a huge effect on our ability to police properly. “There will have to be a reduction in the level of service we can offer, some incidents will simply not be responded to. This is not what the public of Lancashire deserve. In a Home Office announcement last month, it was revealed a further £3.2m was to be slashed from the force’s budget, adding to the £19m cuts it was preparing for by 2017/18. The county’s Police and Crime Commissioner Clive Grunshaw said: “We were preparing for £19m of cuts by 2017/18 but now it’s going to be much more. “The Government keeps taking more and more and at the end of the day it is the people of Lancashire who will see dramatic changes to the way local policing is provided in the future. “The Chief Constable and his team have managed the cuts well and have been looking to implement new savings initiatives such as improved digital engagement and online reporting.